Sketch-Walk 1000s of Years of Archaeological Wonders. Sketchers and Walkers of all levels are invited to join Glenn Tait. All you need is a pen, pencil, sketchbook or a few sheets of paper but feel free to bring aklong your preferred sketching materials and kit. Small watercolour sets and waterbrushes are allowed. Please no open water containers. Glenn Tait is an avid sketcher, illustrator, graphic designer and art instructor who has spent 100s of hours sketching in and around Abbotsford. See Jane’s Walk Abbotsford on Facebook or email glennworkshops@gmail.com for more information. There will be a reception to launch the start of the next current feature exhibit on “The Story We Share.” The exhibit is of original artwork from within the Columbia Bible College Community. The exhibit will run until April 13th and features 3 commissioned pieces by Abby Thompson, Evelyn Boulton, and Catherine Bergs. Artwork by other students, alumni, and staff/faculty are also on display. Snacks will be provided. And as always during regular hours, admission is FREE. There will be a reception to launch the start of the next current feature exhibit on “New Creation.” The exhibit is of original artwork from within the Columbia Bible College Community, exploring “New Creation” and other themes. The exhibit will run until April 18th and features 3 commissioned pieces by students Talya Walde, Jillian Thompson, and Jessica Toews. Artwork by other students, alumni, and staff/faculty are also on display. The Opening Night Reception is Free and there will be snacks, a chance to meet some of the artists, and an opportunity to enter in a draw for a piece of artwork. 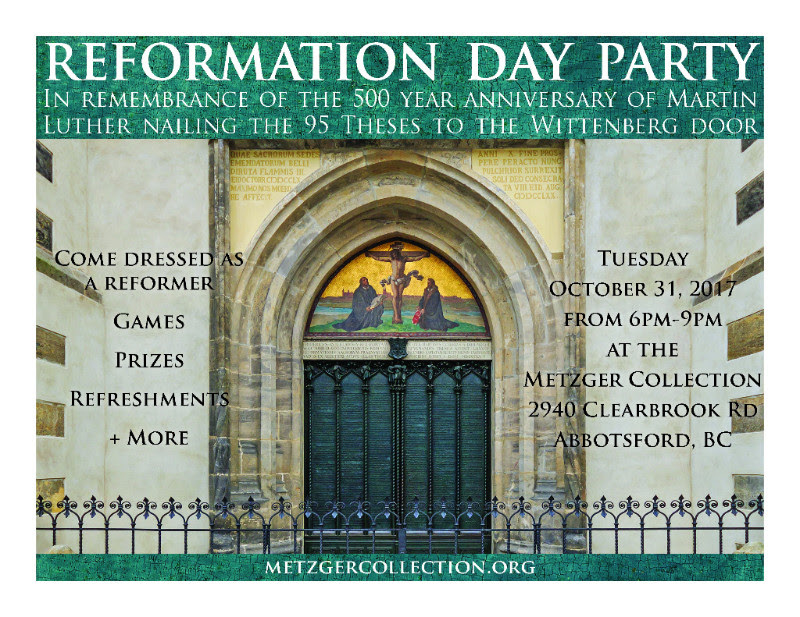 As part of the current Metzger Collection exhibit, “Reformation or Reformations?” and to mark the actual day of the 500 year anniversary of Martin Luther nailing the 95 Theses (October 31st 1517), the MetzgerCollection will be hosting a Reformation Day Party on October 31, 2017 from 6:00pm – 9:00pm. Come dressed as your favorite reformer, play games, enjoy refreshments and maybe win a prize!! Prizes will be given out to first visitors through the door, winners of Reformation trivia and scavenger hunt, and best costume. Costumes of favourite Reformer are encouraged, but by no means required. Abstract: This lecture explored the history of the New Testament, paying particular attention to its copying, translation, canonization, and interpretation (more technically termed the “hermeneutical process”). Related to these issues is the larger question of this ancient literature’s reliability to speak in an ongoing and relevant manner to contemporary Christians living within a “Post-Christian” context. Do these documents reliably record the ancient events and words of Jesus Christ and his apostles? How do we understand their ancient message in light of the increasing number of modern translations? Is the biblical text losing its relevance in an increasingly secular and global society? This lecture and these questions are set to complement and mark the conclusion of the Metzger Collection feature exhibit, “Getting our Hands on the Bible.” The Metzger Collection will be open both before and following the lecture. About the Lecturer: Dr. Clarke is the B.F. Westcott Professor of New Testament Textual Criticism, Greek Studies, and Hermeneutics at Trinity Western University. He has also very generously loaned several precious facsimile manuscripts, including the Codex Sinaiticus, to the Metzger Collection for this current feature exhibit. Check out our current feature exhibit, Reformation or Reformations? Click Here.